The islands are characterized by dramatic landscapes, fishing villages, green pastures and hedgerows of blue hydrangeas. And relatively tourist free. São Miguel, the largest, has lake-filled calderas and the Gorreana Tea Plantation. Pico is home to the 2,351m Mt. Pico and vineyards sheltered by boulders. 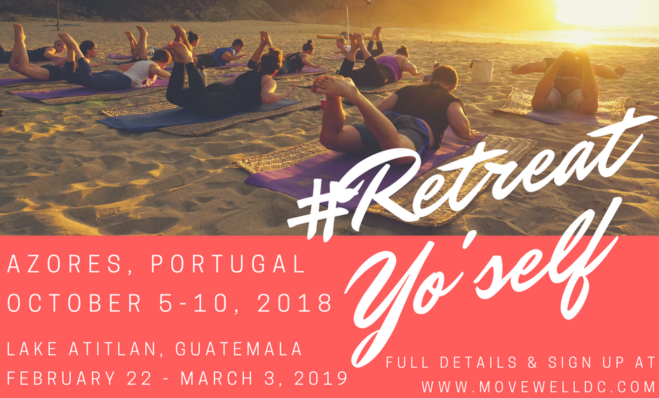 For those of you who love yoga and fitness – here is an ideal retreat trip for you! Our days will include always optional yoga classes (and sometimes bootcamp classes! ), as well as hikes to some of the most incredible vistas on the island, soaks in natural hot springs, and exploration of neighboring towns and beaches. There will also be plenty of time for relaxation amongst the property of our oceanfront, 4-star eco-beach resort. All meals (with the exception of 2 lunches) are included, and will be nourishing, fresh, and delicious, so that you can get a true taste of Azorean fare. Please note that while the official start date of this trip is October 5th, you will need to take a red eye flight from BOS (Boston) or JFK (New York) to PDL (Azores) on the evening of October 4th. We will send you flight recommendations upon booking.